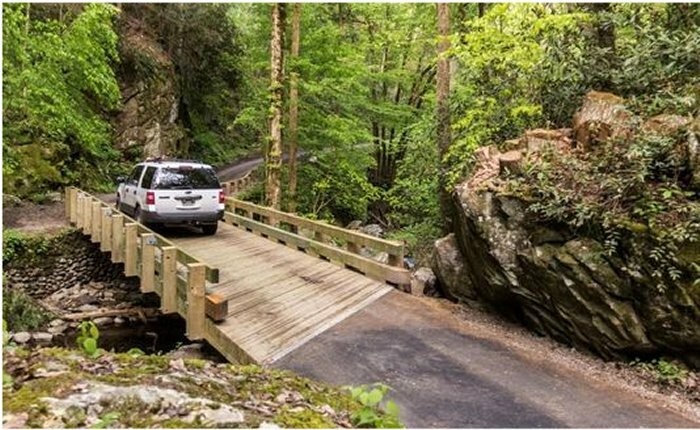 Taking a scenic drive is one of the easiest and most rewarding things you can do in Great Smoky Mountains National Park. With almost 400 miles of roadway in the park and the surrounding scenic area, you can drive to specific locations to enjoy, as well as tour through steadily changing vistas of great beauty. Tips for driving in the park include to start early, slow down and be careful. The park is teeming with wildlife, from turkeys to otters to elk and of course the famous black bears. With so much to see, you and other drivers are easily distracted. And because the park is so popular, there are crowds. And remember, it’s the mountains: roads can be blocked, winter conditions can make things hazardous, weather can change suddenly, especially with lots of rain, and there are animals and people to watch out for. Roaring Fork Motor Nature Trail. Each road is a rich experience with many things to see, with turn-offs, parking spots, scenic overlooks and historic attractions. The smart way to enjoy them is with a Guide booklet. Guides for each road can be purchased cheaply at the park’s visitor centers and the information centers in the towns outside the park. Newfound Gap Overlook – for a spectacular view of Tennessee and North Carolina. Clingmans Dome – presents a vast scene of 7 different states on a clear day. Carlos Campbell Overlook – great for a short trip with probably the best view of Mt. LeConte. Cades Cove is the premium drive for wildlife and a tranquil beauty that everyone who goes there falls in love with forever. Also check out Meigs Falls, a waterfall you can drive to, easily missed along the way, but worth the stop. The drive to Cades Cove from Gatlinburg is along Little River Road, a journey filled with scenic wonders. The Cades Cove loop road is narrow, and a perfect example of the need to slow down, watch for wild life, and go early in the morning or in the evening to beat the crowds. Roaring Fork Motor Trail is a nature trail that you can drive through. It’s a winding, one-way loop road a short distance out from Gatlinburg with historic buildings, old forest and mountain streams. Rich Mountain Road – this is a peaceful road, but you’ll need to take the busy Cades Cove loop part way to get to it. Also add the Cosby and Greenbrier areas to your itinerary, especially in spring for wildflowers. Cosby is never crowded, and Greenbrier has fishing, walks and cascades. Check the park website for general Where to Go info and also for more Off the Beaten Path directions.